With Over 700 Different Dog Breeds, Which One is Best for You? If you really want to drive yourself crazy - quick, pick out the top 3 dog breeds that you would pick today if you purchased a puppy. With over 700 pure breed dogs, some in the categories of toy, small, large, sporting and countless thousands of “mutts” to choose from, which dog is right for you and your family? Anyone who has gone to a humane shelter or pet store and looked into the eyes of those cute dogs, you know the choice is not easy to make. However, before you take the plunge into dog ownership, there are a few questions that you should ask yourself and your family to help you make it easier to pick the right dog. How much Training do you plan to give your dog? Exercise: How much time could you spend exercising your dog? Grooming: How much time would you be willing to spend grooming your dog? Independence – Approximately how much time will your dog spend alone? Friendliness – This question refers to how the dog will react to strangers who come into his territory. Where will the dog be living? Select any activities that you plan to do with your dog. As you can see, there are a lot more decisions and answers to questions than just going down to the local pet store/shelter and picking out the cutest puppy or older dog. You must begin to take into consideration your lifestyle, not only now, but where will you be in the next year, or 5 years or even 10 years. Remember, in most cases, your dog will be your companion for the next decade and you want to make sure that you pick the right dog breed for how you live today and tomorrow. There are countless choices to be made. You can pick from many in the Toy dog breeds category small dog breeds, large dog breeds, sporting dog breeds or the show dog breeds. If you are looking for a pure breed, your local chapter of the American Kennel Club (AKC) has a listing of all akc dog breeds for you to choose from. Another consideration is do you or anyone in your family have allergies…if you do, there are certain dog breeds that have single-layer coats or hairless that would be better for you to have…for a list of those dog breeds, click on the Dog Facts page in this website. At Country Waggin’, we’ll help you pick out that right dog or best dog breed if you haven’t already made that decision. 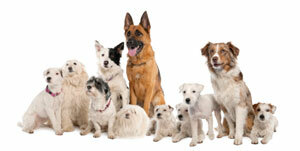 We are experts at letting you know the traits of each dog breeds. If you have any questions, please give us a call at (909) 989-9982 or (951) 734-9925. Click to return Home from "Dog Breeds"
SAVE A LOT OF MONEY ON GROOMING AND BOARDING!